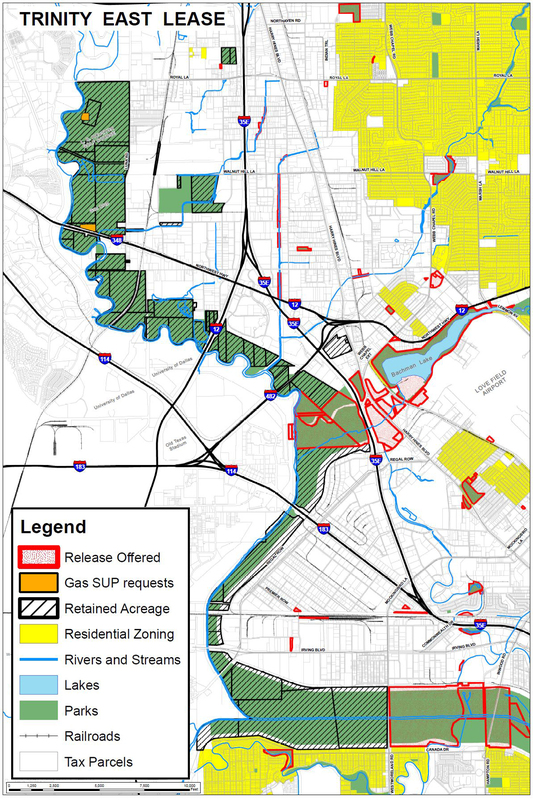 A new map produced by City of Dallas staff members shows that huge swaths of Trinity River park lands, following the waterway from the northwest border of Dallas almost all the way into downtown, has been leased to a company which uses hydraulic fracturing to drill for natural gas. Ironically, the gas company is known as Trinity East. Just as tensions have flared over a proposed parking lot on park land at Winfrey Point, the City Council will soon vote on a new ordinance to govern gas drilling operations within Dallas. Some of the most controversial items Mayor Rawlings and the City Council will vote on will be whether to allow fracking on vast amounts of park lands along the Trinity River and whether to reverse the city’s current prohibition against drilling inside flood plains. Both measures would be necessary to allow gas company Trinity East to move forward with plans to drill on thousands of acres that it has leased along the river corridor. In addition, two park lands in northwest Dallas have been leased to the gas company: Crown Park, home to baseball and soccer fields, and the area of the proposed Elm Fork Athletic Complex. The map released today shows for the first time exactly which areas have been leased to Trinity East. This map only represents the public leases given to one gas drilling company in one part of Dallas. Before the City Council votes on the new ordinance, every Dallas resident should have a right to know where else gas companies plan to start drilling. After recommending for months to place strict limits on drilling in flood plains and to keep drilling operations at least 1,000 feet away from any park land, the Dallas Gas Drilling Task Force reversed course on both issues in the closing hours of its very last meeting. At the time, drilling proponents pointed to one proposed drilling site near the L.B. Houston golf course as an example—but the new map shows that many more areas are at stake. Gas companies lobbied forcefully for these last-minute changes to the Task Force recommendations. Mountain Creek Alliance is hosting a community meeting tonight at 7:00 p.m. at Harmony School in southwest Dallas. City Council members will receive a briefing from the Gas Drilling Task Force on its final recommendations on May 16th at 9:00 AM in room 6ES at City Hall. They are expected to vote on a new city ordinance before their summer break.